There's nothing fancy here, but this box delivers a great performance every time. England is known for many things. Big Ben, red buses, tea, the Beatles, and of course high-end audio. Q Acoustics is following that rich tradition by delivering great-sounding, high-value speakers. Q Acoustics is well known in the U.K.,but the company is a new player in the U.S. market. The M2 Soundbase is my introduction to its product line, and I am impressed. The M2 Soundbase seeks to solve the glaring problem of modern TV’s: horrible built-in sound. The M2's primary function is to make dialog intelligible, give movie and TV programming dynamics and impact, and provide basic audio streaming. This is a product whose focus is delivering sound quality over bells and whistles, and it delivers. The M2 has a downward-firing subwoofer and two Balanced Mode Radiators along the front. Off axis performance is exceptionally good. If your favorite chair is off center or you have people visiting, everyone will feel like they are sitting in the room's sweet spot. The M2 is a sound base, which differs slightly from a soundbar. 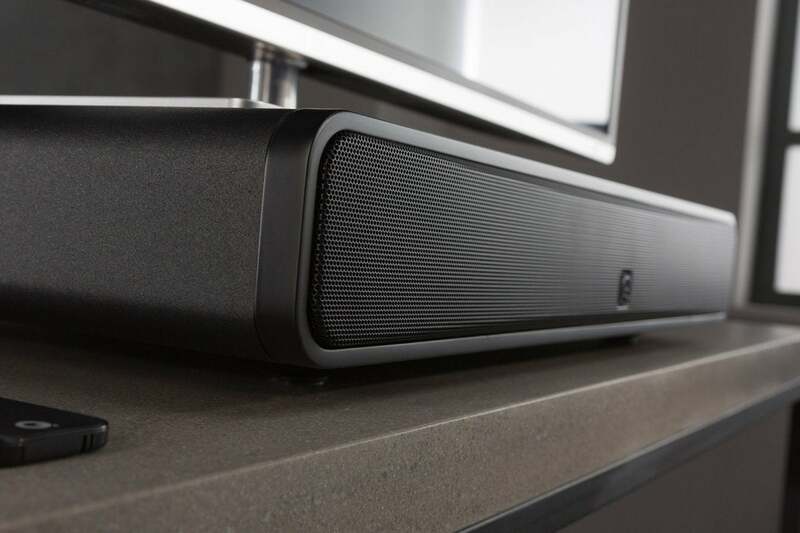 While a soundbar can be hung on a wall, a sound base is intended to be put directly under a TV and (as its name implies) act as a base or support. You can’t hang a sound base on a wall, but you can put it on top of or inside a cabinet. Q Acoustics M2 sound base will support most modern TVs. Setting up the M2 is very straightforward. I had it connected and ready to go in a matter of minutes. I connected my Oppo UDP-203 UltraHD Blu-ray player via Toslink optical and connected the M2 via HDMI to my TV. The M2 supports HDMI’s audio return channel (ARC), so that it can send audio over the same HDMI cable back to the speaker. Your TV must support ARC and you typically need to enable HDMI CEC on your TV for this feature to work. 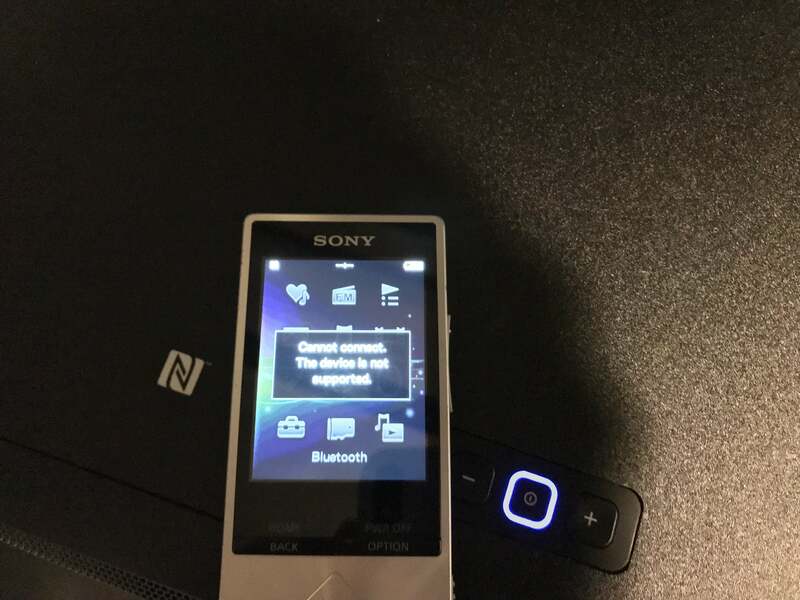 I connected the M2 via Bluetooth to my iPhone 7 instantly, but I had problems using NFC Bluetooth pairing with my Sony NWZ-A17 high-res audio player. When you have devices that support NFC pairing, all you need to do is tap the two devices together and they pair instantly. In this particular case, the Sony kept telling me that it was incompatible with the M2. I never resolved this NFC issue, so I can’t opine if the problem lay with the Sony or the M2. NFC pairing didn't work with my Sony high-res audio player. I should note that the M2 comes with an HDMI cable and a power cord, but no optical cable. To reinforce how new Q Acoustics is to the U.S., my review unit was shipped directly from England and came only with European power cords. I had to use a European-to-U.S. adapter to get the sound base powered up. I don’t expect that to be the case for U.S. consumer purchases. If you plan to use the M2 as a TV base, it can support most modern TVs of reasonable size. If, however, the TV has outer legs as a stand, the 21.6-inch-wide speaker might be too narrow. The M2 comes with a strong assortment of inputs for this price point. 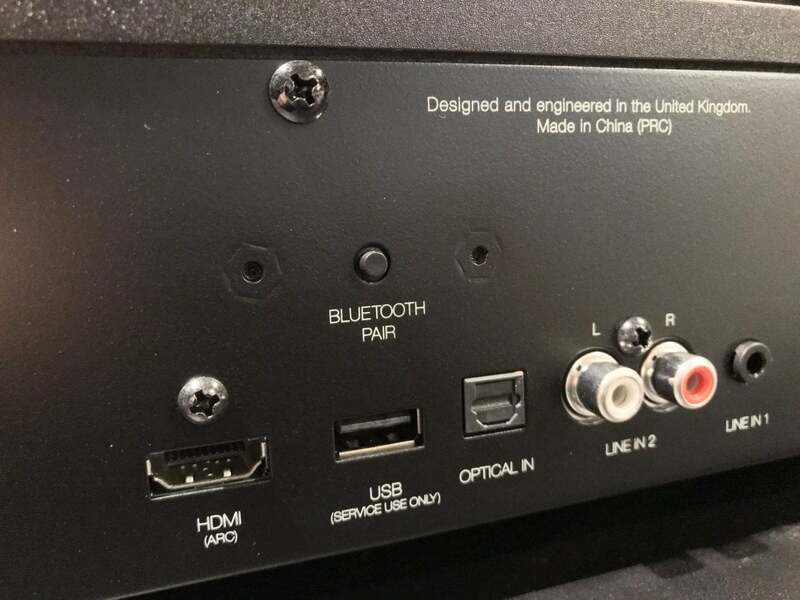 You’ll find HDMI audio via ARC, Toslink optical, Bluetooth with AAC and aptX codec support, and two analog audio inputs, labeled as Line In 1 (3.5mm input) and Line In 2 (RCA input). It’s very rare to find a soundbar or sound base at this price point that supports aptX, which delivers near CD-quality audio streaming over Bluetooth. The standby button's color changes depending on the input selected. Unfortunately, because the light is on top of the unit, you won't see the color if you're seated. 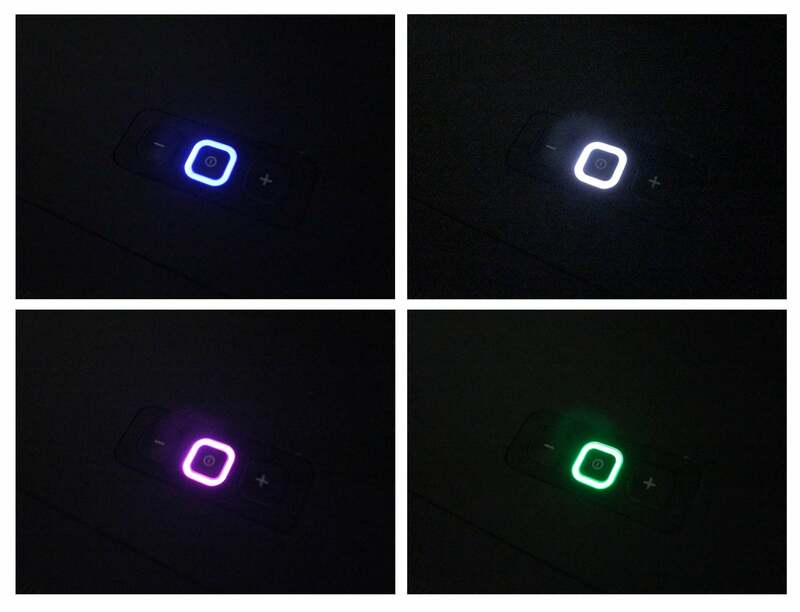 The M2's standby button changes color to show you which input is selected. If you’re looking for Wi-Fi or whole-home streaming, you’ll need to look elsewhere and upwards in price. Something like the Sonos Playbase, perhaps. The M2 also does not come with a subwoofer, and there’s no subwoofer output connection nor support for an wireless subwoofer. While most users will be exceedingly happy with the M2’s performance and not think twice about it, there will be a smaller percentage who find that the bass just isn’t enough. At the end of the day, physics is physics. Q Acoustics boasts that it has designed the M2’s pre-amplifier to be smar, dubbing it the Intelligent Pre-Amplifier or IPA. The IPA will automatically turn the unit on and auto-select a source when it detects an active audio signal. I also appreciated the fact that Q Acoustics provides a prioritized hierarchy of sources. In other words, if two inputs are active at the same time, the M2 will prioritize one active input over another. First priority is given to an active HDMI source, second to the Toslink optical input, Bluetooth is third, and finally analog Line In 1 and Line In 2. You can of course override auto source select by pressing the source select button on the remote or the speaker itself. Input options on the back of the M2 Soundbase. When there’s been no active audio for a pre-defined amount of time, the M2 will automatically go into standby. For HDMI sources, the M2 will honor HDMI CEC control and for optical signals, the M2 will power on when the red optical light comes on or go into standby when the optical light goes off. For analog signals, the off time is 20 minutes. The only caveat to this automated setup is if you connect your TV via optical cable. 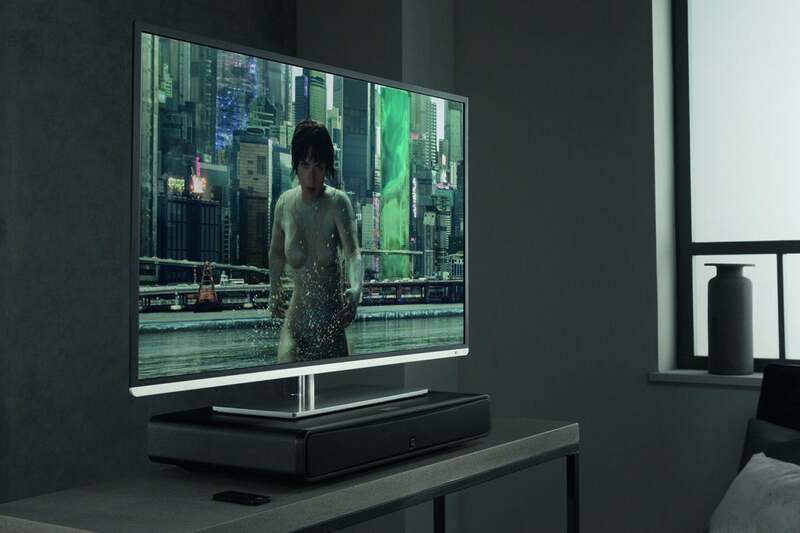 Some TVs will continue to send an optical signal even when the TV is in standby. In such cases, you’ll need to put the M2 into standby using the remote. The M2 has another feature called low source gain (LSG), which you can enable with a rear switch on the back of the unit. Position 1, the default, provides no gain to the incoming signal. LSG Position 2 provides a 6dB gain for optical and HDMI sources should their output be lower than expected. Typically, you’ll never need to use this feature with Hi-Fi equipment. Speaking of gain, you can adjust the volume of each source independently, which can come in really handy. Once you set a volume for a particular source, the M2’s IPA will remember the volume level that you had set and return to that volume level when you re-select that source. There is an effective EQ switch to compensate for sound base placement. Some commercials sound significantly louder than the program you are watching. Some soundbars and sound bases have a feature to tame these rogue commercials. The M2 does not. The included remote is of the small, half-credit card size variety. Circular buttons are aligned vertically. The remote is not backlit and the small, light printing on each button makes it difficult to see what each button does in dimly lit conditions. These design problems are unfortunately typical of many consumer electronics products—including soundbars—at this price point. I wish that the remote was better designed for no-look use. For example, the power toggle button should have been larger and red, the volume buttons could have been a different shape, etc. Thankfully, M2 can be controlled by a satellite, cable, or third-party remote control, so you only have to deal with a single remote. The Q Acoustics full user manual (only available from the Q Acoustics website) takes you through all the steps needed to program the M2 with a universal remote or the typical TV or set-top box remote. 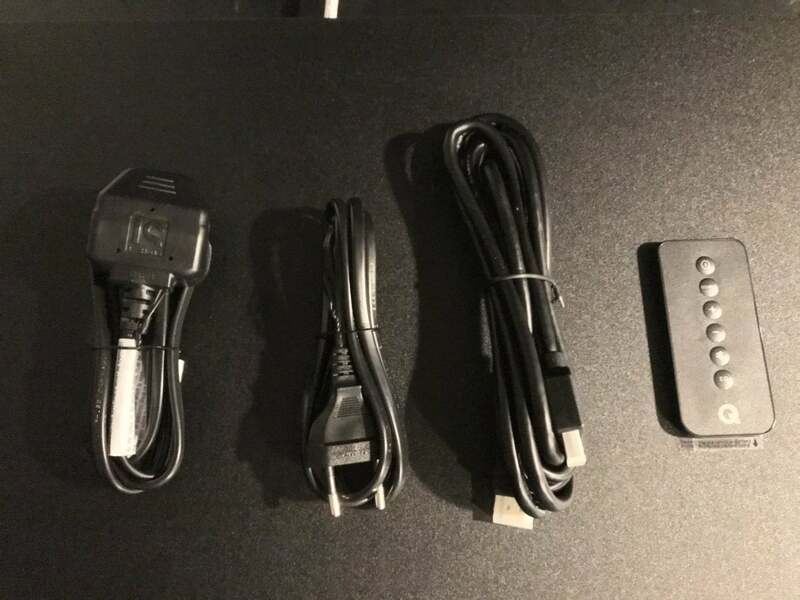 You get an HDMI cable and remote for accessories. Q Acoustics shippped me European power cords with this early review unit. How a speaker sounds depends on its placement. Soundbars and sound bases are no exception. 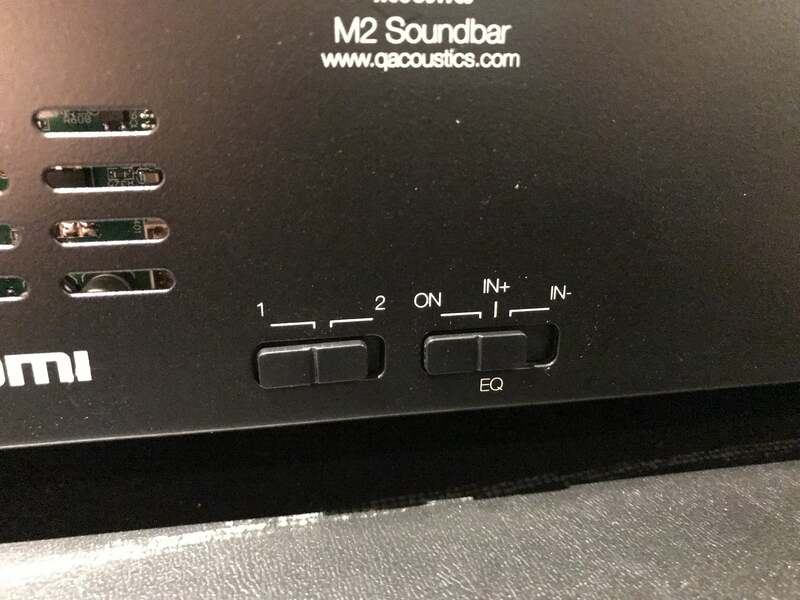 Thankfully, the M2 comes with three EQ settings to help tame typical sonic anomalies based on placement. The ON setting is optimal for placing the M2 on top of a cabinet, IN+ if the speaker is placed in a large cabinet and IN- for placement in a small cabinet. It’s clear that the EQ changes the response of the bass and lower midrange, the same frequencies that can become muddy or boomy when put in a cabinet. The IN+ and IN- attenuate those frequencies to differing degrees. I set up the M2 in my home theater on top of a table. The M2 sound base consistently delivered highly intelligible dialogue without any gimmicks or acoustic trickery across a wide range of seating positions in my home theater. I watched and listened to Rogue One: A Star Wars Story and I had no trouble whatsoever understanding every bit of dialog perfectly. Dialog engulfed by complex audio objects, such as the crowded market or ambush scenes on Jedha, Jyn before the Rebel Council, or the X-Wing attack on Eadu always came across cleanly, crisply, and didn’t have artificial timbre. You'd be surprised how many soundbars struggle with these elements. That being said, dynamics are a bit compressed, and you will experience some “boxiness,” and the bottom end just doesn’t dig down really deep. Explosions and other typical movie effects don’t have the same impact that you’ll find with systems featuring a subwoofer. Those quibbles aside, the M2 was a solid performer throughout. 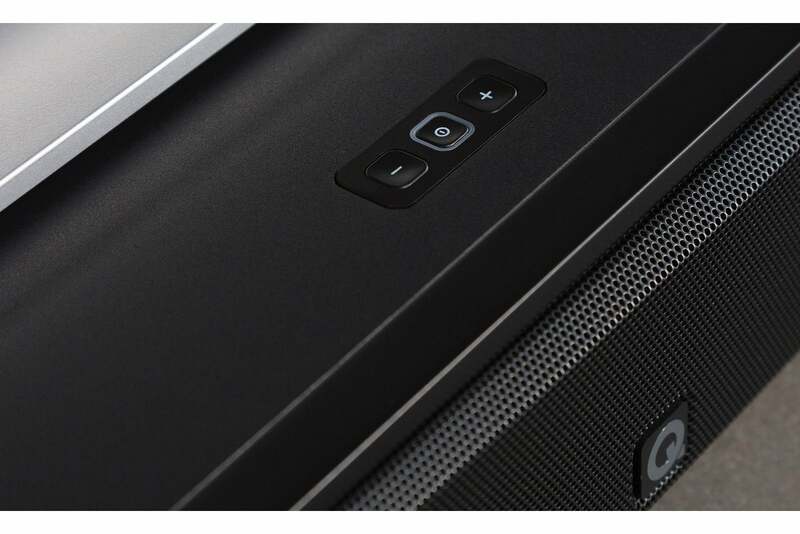 Q Acoustics M2 sound base has a metal grille and a spartan assortment of buttons at the top. The Q Acoustics M2 sound base aims at just one thing: delivering highly intelligible dialog and superb audio. And it succeeds. If you’re looking to upgrade your TV’s built-in audio experience at a very reasonable price, you just cannot go wrong with the M2. To overcome the M2’s major shortcomings--compressed dynamics and lack of deep bass--you’ll need to spend significantly more money. But, if you’re you’re looking for a sound base that delivers a solid value at a killer price, the M2 is a great choice. Q Acoustics' no-frills M2 Soundbase will upgrade your TV's audio.